In this section we will be covering gems and minerals that have a history and lore of protection and may be useful in keeping one safe on an investigation or at home. We are not suggesting that any health benefits of these stone are medical advice, or should replace going to a medical professional in case of aliment. We are focused on the metaphysical aspects of the stones. Main use - Stone to Soothe and stimulate the mind and emotions. Throughout history the special virtue of Amethyst has been that of preventing drunkenness and overindulgence. Ancient Greeks and Romans routinely studded their goblets with Amethyst believing wine drunk from an Amethyst cup was powerless to intoxicate, and a stone worn on the body, especially at the navel, had a sobering effect, not only for inebriation but in over-zealousness in passion. Catholic bishops also wore Amethyst in a ring to protect from mystical intoxication. Kissing the ring kept others from similar mystical intoxication and kept them grounded in spiritual thought. 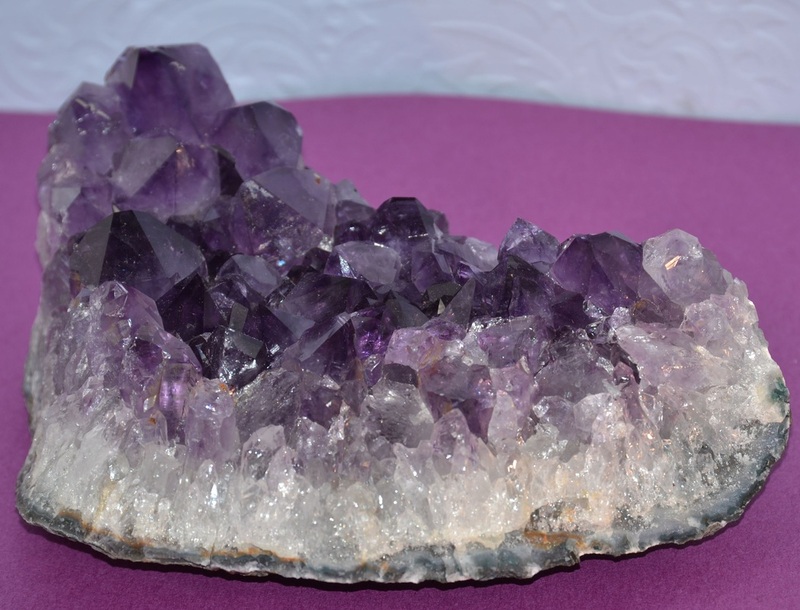 Amethyst is reputed to control evil thoughts, increase intelligence and render men shrewd in business matters. Amethyst is popular in rosaries and prayer beads due to the stone’s atmosphere of pious calm, imbuing a sense of mental peace and quietude. Travelers wear Amethyst as a protection from treachery and surprise attacks, it keeps soldiers from harm and gives them victory over their enemies. It is considered a powerful psychic stone of protection against witchcraft and black magic and was said to lose its color and turn pale when placed near an angry attacker. Amethyst protects against psychic attack, paranormal harm or ill-wishing, and returns the energy back to the universe after being transformed into positive, loving energy. To increase this power and attract good luck, draw an image of the sun and the crescent moon over an Amethyst in lavender incense smoke. Called the “All-healer,” Amethyst is one of the most effective crystals for healing people, plants and animals. Amethyst counteracts negative earth energies beneath buildings or anywhere that feels hostile. Like other royal stones it protected its wearer from disease and contagion. Amethyst is believed to help with hearing problems and may aid in health problems relating to the skeletal system such as arthritis and back problems. Amethyst may help with disorders of the digestive system, nervous system, heart, stomach and teeth.Referred to as “nature’s tranquilizer,” Amethyst calms and soothes, assisting the transmission of neural signals through the brain. It relieves obsessive compulsive disorder and hyperactivity in children and animals. It can also be used to overcome addictions. A bear engraved on an Amethyst has the virtue of putting demons to flight, and defends and preserves the wearer from drunkenness. Leonardo Da Vinci, a scientist, inventor and artist, believed that Amethyst has the ability to dispel evil thoughts and boost intelligence. The Peruvians held a belief that if the names of the sun and the moon were engraved on an Amethyst and hung around one’s neck with a baboon’s hair, or a swallow’s feather, it would act as a spell against witchcraft. Amethyst was an amulet of protection worn around the neck of Egyptian dignitaries when they traveled outside their major cities. They believed it safeguarded them from personal treachery and ambush. Placed under the pillow or mattress, or rub the center of the forehead counter-clockwise to cure insomnia and stimulate pleasant dreams. It is especially effective for children’s recurring nightmares and fears of the dark, and may help alleviate homesickness. In traditional Chinese medicine, amethyst is prescribed for stomach pains and bad dreams.Natural unpolished Amethysts or geodes are particularly helpful placed where plants will not grow or animals refuse to sit.